You must see the garden,” said the guard, in French, pointing to a door in the Delacroix Museum that my daughter and I hadn’t noticed. It led outside and down two sets of stairs to an exquisite courtyard, a silent oasis below the studio where Eugène Delacroix lived while he struggled to finish his last great work, the murals of the church of Saint-Sulpice. Izzy was in Paris rewriting a novel. I was there to savor the city with her, and to detox. Too much Trump was poisoning my spirit; I needed a break from MSNBC. Too many people in my life have been ambushed by Stage IV cancer; I needed to show myself that I know how short life is. I don’t want to make too big a deal of it, but something stirred in me that morning in the garden. I’m still trying to understand it, but this much I know: It’s about Delacroix’s struggle with “Jacob Wrestling with the Angel,” and my struggle with what Jacob wrestled with. It’s also about Being, and being Jewish. I grew up in a Forverts-reading home, and we belonged to the shul on the corner. By the time I was 8, I was terrified that if I didn’t obey all the mitzvot in the Torah, the God who ordered Abraham to sacrifice Isaac would not hesitate to sacrifice me. By the time I was learning my Haftorah, I was also learning that religion is a crock. By 17, I’d discovered that God is dead, randomness rules and life is absurd. By 21, I’d figured out that anyone with half a brain had discovered the same thing. By 25, I tried grabbing Camus’s lifeline: Embrace the absurdity. Pointlessness is a punch line. Imagine Sisyphus happy. But by 40, I wasn’t laughing — I was grinding my teeth. Mortality was no barrel of monkeys. So midlife brought motivation to trade the dead end of nihilism for the path of the seeker. I’ve cribbed from a fair number of wisdom traditions since then, but my spiritual toolkit has always had a high barrier to entry: I can’t bring myself to try something that’s at odds with science and reason. But I have explored yoga, meditation, weightlifting and other practices that don’t require belief in anything; you just need to show up and do it. I’ve also looked for meaning in philosophy and literature: From Stoicism and neo-Platonism to Buddhism and pantheism, I’ve found plenty of enlightenment technology to test drive. But along the way, as I’ve constructed my idiosyncratic spiritual self, one question has nagged at me: Am I still Jewish? Not latke and borsht-belt Jewish; not High Holidays Jewish; not matrilineal and diaspora Jewish; but Jewish Jewish — a descendant of the covenant, a child of Israel. Who exactly did Jacob wrestle with? 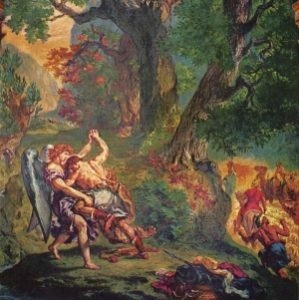 The text calls Jacob’s adversary an “ish,” the everyday Hebrew word for “man,” but the prophet Hosea says it was an angel, and Jacob himself implies it was God. They grappled all night long. As dawn was about to break, his opponent, “because you have struggled with God,” gave Jacob a new name: Israel. Jacob had the audacity to contest the Almighty, but (spoiler alert) far from being smitten, he was awarded paternity of the Jewish identity. That’s been my rationale for claiming membership in a tribe whose authority I resist. Even in their origin story, the people of Israel are the people who wrestle with God. No blind faith for us; no unquestioning obedience. Our DNA is doubt. Combat, interrogation, argument are the essence of our existence. Even the Orthodox argue, especially about halakhah. There’s a reason the Oven of Akhnai is among the Talmud’s most quoted stories: It nails the case for disputation over fundamentalism. In my understanding of Jacob, God tests him, and God rewards him. But Delacroix’s d’var Torah is different. “Grappling with the Modern,” the museum’s show about the making of the Saint-Sulpice murals, displays his sketches, studies, letters, journals and the art that influenced him. By the time Izzy and I descended to the garden, I was seeing the Jacob story through Delacroix’s eyes. Here’s what I took from the exhibit: Delacroix depicts Jacob and the angel as equals. They’re twins in musculature, twins in age and stature. No, more than twins — they’re two versions, two aspects, of one man. Jacob combats himself; Jacob renames himself. Just as the characters in a dream are projections of its dreamer, the characters in this drama are all Jacob. There is no God in this story. The only God is Delacroix, the artist wrestling with his art, struggling to bend his creativity to his will. Taking this in, I felt more than a little sheepish about invoking Genesis 32 to authenticate my Jewishness. Talk about tautologies: I wanted the God of the Jacob story to declare my independence from a God whose existence I deny. I needed a God I don’t believe in to believe in me. I could feel the definitional power I’d invested in the story slipping through my fingers. If I insisted calling my eccentric spirituality “Jewish,” it was pretty lame to invoke Torah — whose literal truth I had long since lost faith in — to prove it. My sheepishness dissipated in the garden. My puzzlement about being Jewish gave way to my amazement at there being anything at all — this bench, these eyes, the song of those birds. I basked in the beauty of the place, and of my daughter; I felt gratitude for the miracle of love, and awe at the mystery of art. And yet, lost in that sublime, I found myself rattled by dread. What fresh hell did I fear? I had come to Paris to take a breather. The life I left — deranged tweets, a friend’s bad MRI, calls in the night, the gathering storm — was patiently waiting for my return. My jerry-built mindfulness says, “Be here now.” But what “here” and what “now” could be more maddening? Whose destiny, whose delusion, is it to wrestle with that? Or is it tragic? I think of another storm, another angel, “Angelus Novus,” Walter Benjamin’s “angel of history,” who sees the past as “one single catastrophe which keeps piling wreckage upon wreckage…. The angel would like to stay, awaken the dead, and make whole what has been smashed. But a storm is blowing from Paradise; it has got caught in his wings with such violence that the angel can no longer close them.” The storm was Nazism. Benjamin joined those dead by his own hand, despondent that (as he wrongly believed) his escape was doomed. I don’t know if burning the hours I do on news makes me a more muscular warrior for democracy, or blinds me to the green of my garden. I don’t know whether my mindfulness of the randomness of misfortune makes me any less fearful of catastrophe, or any more consoling a companion. But I do know this: As a descendant of the wrestler Jacob, my DNA has a dominant gene for tikkun olam — the duty to repair the world.